The prospects for internet security 2015 are looking up. You should consider looking at the new versions of antivirus products like Vipre for your own sake. So, what’s new in Vipre 2015? Download Vipre 2015 from the above given download link. Its installation is very simple. To upgrade to the newer version you can remove the old version and after installing new version use the same license key to get activated your new Vipre 2015 product. If your license has been expired and you are having trouble in Upgrading or Renewing. Then try Official Vipre Removal tool to uninstall Vipre completely from the PC and try Installing it again. If the problem still persists then Contact to the Vipre Tech Support department of its Customer Support. We will review Vipre antivirus 2015 from a number of perspectives. That way, you will be able to get an idea of what you can expect from the product from individual angles. Vipre has been in business for over two decades. One of the most significant changes that have been made is to the interface. 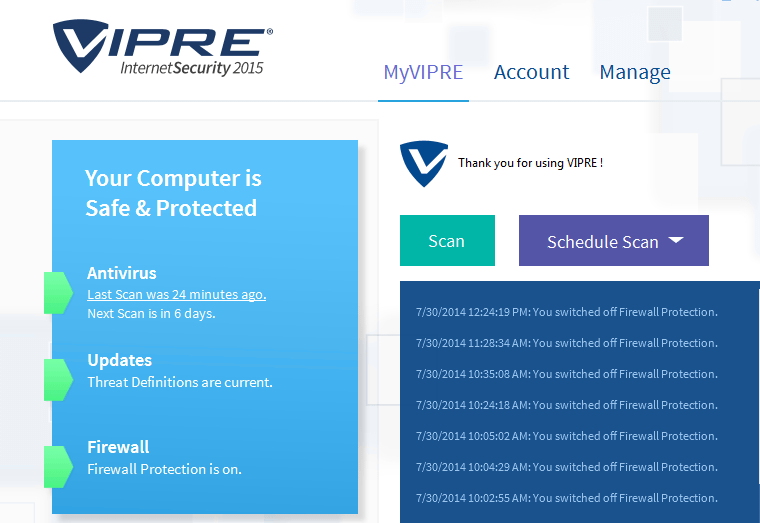 Finally, the Vipre 2015 Antivirus has a new interface! The new interface design makes it much easier for you to enjoy the security services of Vipre. First, the software is much better in terms of aesthetics. The interface is no longer dated. You can now get the benefit of advanced functionality as well as enhanced user-friendliness. While the overall window offered within the program is quite small, the navigation is superb. You can access every security service on offer quite easily. Vipre’s ability to keep off deal with spyware and viruses is what makes it so popular among its fans. The protection mechanism of Vipre products has been enhanced for 2015, even though it was superb before. The new version of antivirus software can fight new virus versions effectively, even those that are deeply embedded. You will also be able to use the product to scan for malicious links on your Facebook timeline. You will be warned of the danger via an alert or private message. The internet security version of Vipre offers you the chance to enjoy new firewall drivers. The drivers have better functionality. IPv6 support has been added for one thing. You will also be able to perform upgraded without needing to reboot the new WFP driver. Using the 2015 Vipre internet security software, you will also be able to create rules that are more granular. This means those individual svchost-hosted services. You will also be able to identify services, which are hosted courtesy of Windows 8 ModernUI application base rules. Your Firewall services are therefore, going to be much better than they were before, especially if you utilize the internet security version. It is important that your deleted data stays deleted. Unfortunately, that is not always the case. Hackers can get access to your computers and then reconstruct your deleted files, which you wanted to keep secret. With the 2015 Vipre Antivirus software however, that is no longer going to be a matter for concern. You will be able to delete your computer files and any track of their previous existence. That way, deleted files will stay gone. In addition, some programs tend to collect information about your web surfing habits. That means that plenty of data concerning you may be out there, waiting to be harvested. Scary thought, is it not? What Vipre will do is to delete the program history that has stored your cookies, and temp files or any other historical data. The software also has a list of programs that have a tendency to collect your personal information, even if you have not installed those programs just yet. You will have the option to select the programs that you have authorized to collect information about you though. All the other programs will have their history removed for your own sake. How cool is that? How Vipre cleans out your historical data can come in very handy. If someone manages to bypass your security, he can get access to your personal details via your history. However, because Vipre 2015 will have deleted all that historical data, it will be hard for your financial information to be used against you. Clearly the 2015 Vipre Antivirus software is new and improved, there is no doubt about that. The features that have been added or enhanced are all meant to ensure that your security is not compromised. You may need to opt for the internet security version though, if you want to enjoy the added benefit of a more robust firewall. In general, Vipre offers you a great product. The features are superb in every way. The reviews and ratings of major stakeholders in the security industry should assure you that you are getting a superior product, which is well worth your hard-earned money. What more could you ask for? Vipre is good cheap antivirus. It also offers life time license. But still you can find some good coupon codes and promos to buy this antivirus or Internet security in cheaper price. Save money using Vipre Coupons. Good Software. Thanks for the info.